We Drink Your Milkshake! : TERMINATOR: GENISYS Trailer Drops! Whether we want it or not, a new Terminator trilogy (yes, you read that correctly) has begun. The last two films, RISE OF THE MACHINES and SALVATION, left almost no impression on the film going audience. I saw both and can't even tell you what they were about. But apparently some believe there is still enough people out there who want to see yet another version of this story. On the verge of winning the war against Skynet, Connor sends his trusted lieutenant Kyle Reese back through time to save his mother's life and ensure his own existence. But what he finds on the other side is like nothing he ever expected. After being orphaned at age 9 by a Terminator, Sarah Connor has since been brought up by another Terminator, played by Schwarzenegger, programmed to protect her. This Terminator has then trained her to face her destiny, which she adamantly tries to reject. Check the trailer out below! Yet another time traveling person sent to save someone from the past? It's starting to get old. Plus, the story line is starting to get almost SAW level of convolution. With some many people time traveling, it's almost impossible to keep the worlds straight. But Clarke's Sarah Connor does seem pretty badass. Her performance might be worth seeing the film. But I'm not completely sold. It's time to let this franchise die. 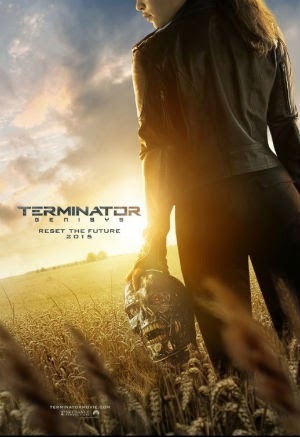 TERMINATOR: GENISYS will be released July 1, 2015, is directed by Alan Taylor, and stars Emilia Clarke, Jason Clarke, Jai Courtney, Matt Smith, and Arnold Schwarzenegger.